Asha Hagi Elmi (Somalia) was the first Somali woman to sign a peace agreement on behalf of civil society in Kenya in 2004. 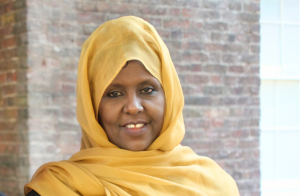 She was Vice-Chair of the Civil Society Executive Committee and Member of the Leaders Committee of the Somali Peace and National Reconciliation Conference and Founder/Chair of the Sixth Clan: a brand new approach for an all-inclusive national peace and political decision-making process (March 2000 – present). Since 2000 she has served as Honorable Sixth Clan member of the Transitional Federal Parliament of Somalia and was sworn in as a member of the Pan Africa Parliament in Johannesburg (May 2006).